Expired 9mo ago . Last validated 11mo ago . Used 25 times. Isaac Aguilar I am validating that this deal works as described. This great code still working, use this code during checkout and enjoy this discount. 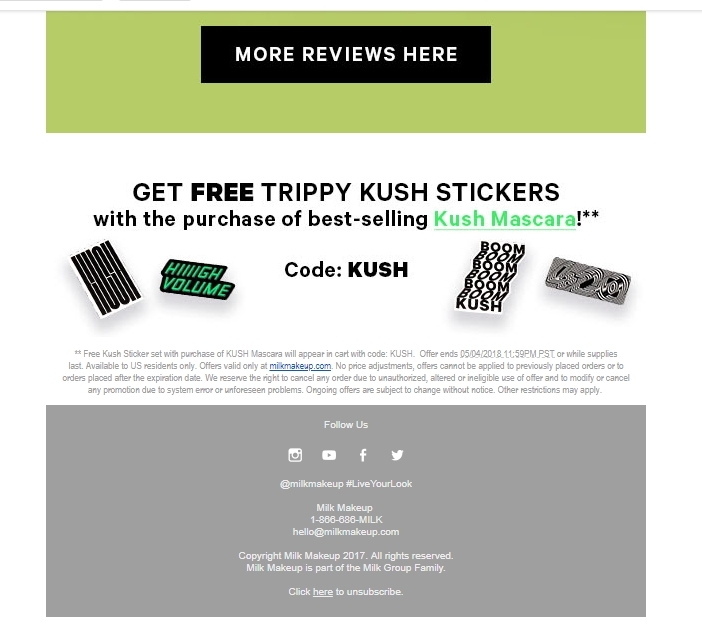 Laura DeLuca Free Kush Sticker set with purchase of KUSH Mascara will appear in cart with code: KUSH. Offer ends 05/04/2018 11:59PM PST or while supplies last. Available to US residents only. Offers valid only at milkmakeup.com. 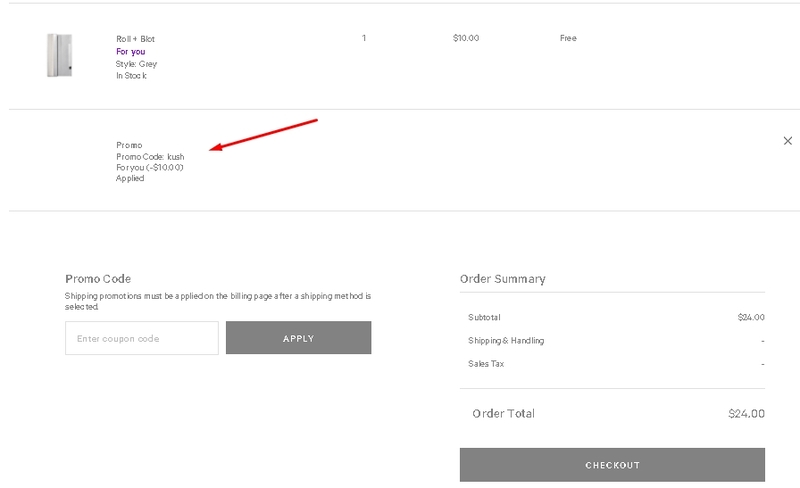 No price adjustments, offers cannot be applied to previously placed orders or to orders placed after the expiration date. We reserve the right to cancel any order due to unauthorized, altered or ineligible use of offer and to modify or cancel any promotion due to system error or unforeseen problems. Ongoing offers are subject to change without notice. Other restrictions may apply. Marcela Velasquez This deal was tested and works as described. Use the promo code at the checkout and you will receive the discount. 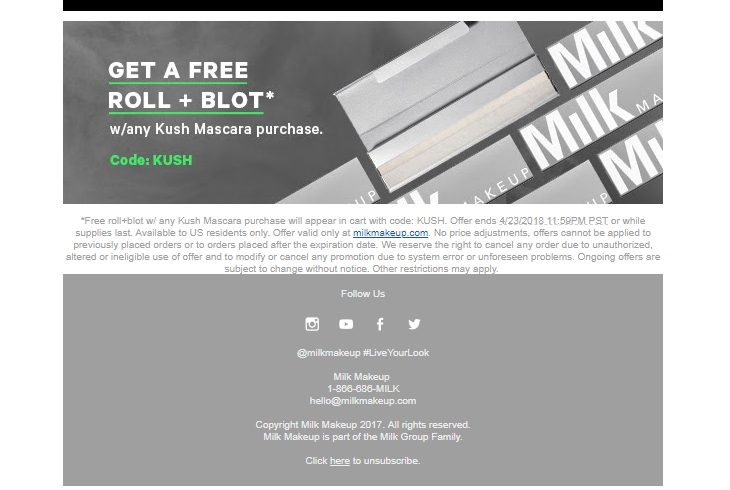 Laura DeLuca *Free roll+blot w/ any Kush Mascara purchase will appear in cart with code: KUSH. Offer ends 4/23/2018 11:59PM PST or while supplies last. Available to US residents only. Offer valid only at milkmakeup.com. No price adjustments, offers cannot be applied to previously placed orders or to orders placed after the expiration date. We reserve the right to cancel any order due to unauthorized, altered or ineligible use of offer and to modify or cancel any promotion due to system error or unforeseen problems. Ongoing offers are subject to change without notice. Other restrictions may apply. 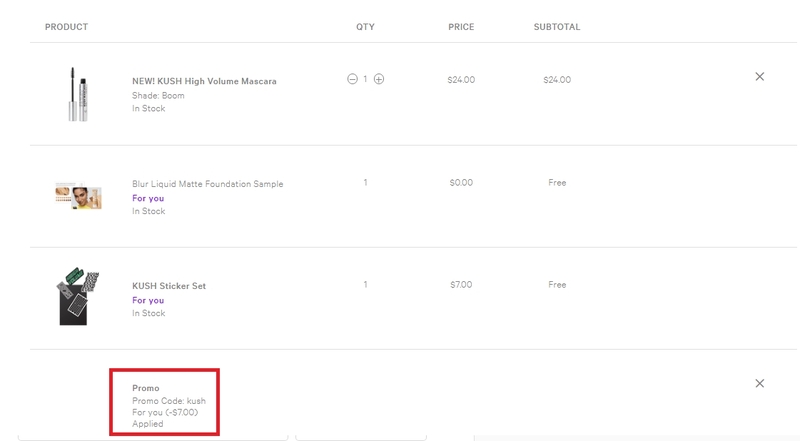 Eva Fisher Free eyelash curler will appear in cart with code: KUSH. Offer ends 4/20/2018 11:59PM PST or while supplies last. Available to US residents only. Offer valid only at milkmakeup.com. No price adjustments, offers cannot be applied to previously placed orders or to orders placed after the expiration date. We reserve the right to cancel any order due to unauthorized, altered or ineligible use of offer and to modify or cancel any promotion due to system error or unforeseen problems. Ongoing offers are subject to change without notice. Other restrictions may apply.